Mother's Day is coming up soon -- have you figured out what to give your mom? Clothes? Jewelry? Pampering body care products? Why not give her all of it? With today's giveaway, one very lucky Bonggamom Finds reader will receive a huge bundle of goodies, just in time for Mother's Day! Keep reading to see what's included in this $200+ prize pack, and how to enter. The Bar Method (www.barmethod.com) will provide the winner with 1 Pregnancy DVD (valued at $20) and 1 onesie (valued at $17). 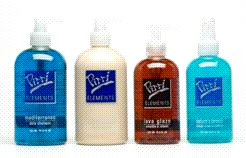 Pirri Elements & Elemental Tools will provide the winner with one of each of the products from their Pirri Elements line (valued at $88 total) -- Mediterraneo Daily Shampoo, Earth's Balance Daily Conditioner, Lava Glaze Smooth & Relaxing Serum, Nature's Breeze Detangler & Leave-In Conditioner, . For a full menu of Pirri's services and products, please visit: www.pirrihairgroup.com. SwimsuitsForAll.com will provide the winner with an exclusive site-wide discount code for UP to 50% off sitewide, for their unique swimwear, apparel & accessories for real women, sizes 8 & up. Adesign will provide the winner with “The Eye Set” (valued at $45) with All Over Eye, Eye 2 (basic soft eyeshadow brush), Eye 4 and Eye5, in a travel-friendly pencil case. For more details and information check out the Adesign brushes website at adesignbrushes.com. Leave a comment on this post and tell me how you plan to honor your mother this Mother's Day. 3) Share this giveaway (http://bit.ly/HZx29E) on your Facebook page (1 entry). This giveaway ends at 11:59PM PST on May 1, 2012; I will draw a winner at random on May 2 and post the winner's name after the winner confirms acceptance. For additional giveaway rules, click here. Good luck! Disclosure: I did not receive a sample or monetary compensation for this post. Product information is provided by the featured company/product. The views and opinions expressed here are my own. I buy her a heartfelt gift and spend a few hours with her. I'm going to present her with gifts and have a meal at my sister's house with her. Thanks. We'll have a picnic for my mom on Mother's Day. I will be making some sweet treats for my mom and MIL. I also plan to get a few pots and fill them with seed packets as small gifts. Spend the day with her and give her a gift that is special to her. I'm making a donation in her name to a local women's shelter. I just lost my mother, so this is going to be a difficult time for my family. My mom and dad just moved into their new lake home, so this year I'm getting plants for her yard! By giving her a gift that she has always wanted, a necklace with each our birthstones on it. Will prepare nice dinner for her. I'm gonna cook dinner and clean up the house. Congratulations to #83, Kimberly R!